Gedney – A brave team of six led by Steve woke at 01:00 to travel round to set nets ahead of the morning tide. An additional nine members of the team joined them on site at 04:00. There was a small window to catch before it became too light and a modest number of waders were caught which provided new visitors to the group a nice introduction to the group’s procedures. The only other thing of note from the catch was a young Herring Gull caught by hand near the processing area by Ros. Lucy, Rob and Nikki went to recce the Norfolk beaches. There were c. 70 Sanderling on Snettisham, 20 Turnstone on Heacham NN and Ringed Plover thinly spread throughout. It was thought the poor weather deterred birds from roosting on the beaches. Rob stayed out longer to resight colour marked birds. With few options for catching some members of the team, led by Steve, travelled to Lincolnshire to set for a speculative option for Grey Plover the following day. Ron and Clive recced Holbeach area for Greenshank finding five individuals on the regular pool at Lawyer’s Farm as well as 33 on a new pool on Lundy’s Farm. A small team consisting of Rob, Gary, Louise, Sam, and David travelled to Snettisham for an afternoon of successful resighting with over 100 sightings collectively, mostly of Curlew and Bar-tailed Godwit. The resighting team went directly to meet with the remaining Norfolk team led by Lucy and Richard to set three nets on a ridge on Snettisham Beach for Sanderling the following day, with an expectation numbers would increase on the larger tide. 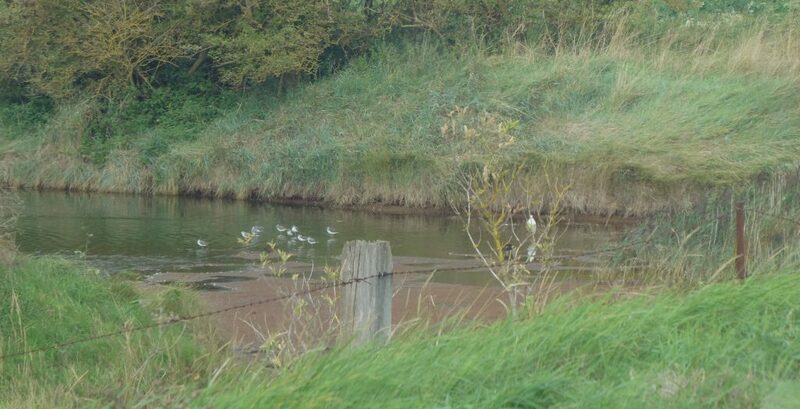 Leverton – A small team set a single net to target Grey Plover. A small number of birds came into the catch area as anticipated shortly before tide and a small catch was made. Snettisham – The Norfolk team were in position by 05:45 on the beach awaiting birds to come into position. It was a difficult set on a ridge along the beach meaning there would only be a small window either side of tide to make a safe catch. Bird numbers had only increased slightly to c. 80 and despite twinkling efforts to manoeuvre the flock no catch was made. One Hobby was sighted over base camp. Rob recced the Ken Hill area while we waited to make a catch. The majority of the team travelled to Lincolnshire on Sunday afternoon to set a clap net pair for Curlew the following day as well as one for the evening tide. Rob, Cathy, Tim, David and Sam remained in Norfolk to recce. Some additional colour marks were resighted on the rising tide at Snettisham. Horseshoe Lagoon – a single net was set tidily along the edge of the vegetation of the lagoon and a nice mixed catch of Redshank and Greenshank were caught. A Short-eared Owl was observed at dusk behind the inner sea wall. Wrangle Marsh – The team were in position for 05:30 on the marsh with a small team near the nets under a tarp and the remaining team over the sea wall. The catch area was seen well by Steve, Ros and Gary in the hide and Richard on the opposite sea wall. Curlew began moving up the marsh in pre-roosts nicely with the tide but were generally reluctant to settle with the decoys in the catching area. It is unknown why but there was a reasonable amount of construction activity on the new sea wall. The majority of the several hundred Curlew roosted c. 100 m south of the hide away from the catch area. Once high tide had passed it was decided to fire on the seven birds safely in the catch area, unfortunately due to slightly higher water level than expect there was a misfire resulting in only two being caught. Recces both north and south of the morning catch yielded several thousand Bar-tailed Godwit and Curlew roosting on the marsh but reluctant to come onto fields. Recces in Norfolk found groups of 100+ Curlew on the Royal Estate and Ken Hill, nothing off the marsh at Terrington and 400+ Sanderling at Heacham NN. The Norfolk team then undertook various maintenance jobs around the base house while Rob continued resighting. The Lincolnshire team spent Monday afternoon setting two net sets on fields near where large roosts had been identified in the morning, led by Richard and Steve at Friskney New Marsh and Bowsers Farm respectively. It was anticipated birds would be forced off the marsh the following morning. Monday evening was a departure from the regular group activities as many of the Lincolnshire team headed to the Horseshoe Lagoon area to attempt to catch Little Grebes where a group of up to 10 had been seen earlier. Two attempts were made to drive birds towards a net suspended from a bridge resulting in one caught and ringed. Once back at base in Lincolnshire a pleasant evening was spent including some cake, wine and speeches for Clive which also included several of the more memorable stories from his early years on The Wash.
Bowser’s Farm – Steve’s team was in position ahead of high tide after placing several decoys in the strimmed catching area to make it more attractive for birds to roost. Several hundred Curlew could be seen over the sea wall and at times a few individuals came to investigate the catching area but didn’t settle. The tide cut leaving some islands exposed on the marsh where the majority of birds were roosting. It was decided to leave the set in place and try again the following morning. Friskney New Marsh field – Similarly no wader came over the sea wall to roost on any of the arable fields. Additionally it was a busy raptor day for Richard’s team with Marsh Harrier, Merlin and Kestrel all around the catch area. Again the decision was made to leave the set in place for the next day. Clive recced nearby fields in the Friskney area and found a small number of Curlew coming off the marsh but generally very few. Still no birds coming off the marsh at Terrington or Holbeach on to fields. Cathy visited Lawyer’s Farm and found 10 Greenshank on the regular pool. The Royal estate and Ken Hill attracted no waders either as there was a strong off shore wind giving no shelter in the usual spots. However Rob found 600 Curlew sheltering at the pits and had a successful encounter with 35 previously flagged birds. Mike and Daphne, who were visiting Norfolk, joined us for parts of the next three days. Daphne helped Cathy prepare vast quantities of donated apples, which were mixed with the blackberries we had picked at Snettisham and made into crumble. The Lincolnshire team split in the evening with one team led by Richard setting a single net at Lawyer’s Farm for Greenshank. Ten birds came into the pool again ahead of high tide but were unfortunately never catchable. The remaining Lincs team returned to the Horseshoe Lagoon area, led by Steve, to attempt to mist-net Common Sandpiper along the channels. This was also unsuccessful. Bowser’s Farm – The team delayed getting into position and setting decoys due to rain. At c. 1 hr before high tide the weather was calm enough to finally set and get into position. Almost immediately Curlew began to come off the marsh and investigate the adjacent fields. Around 40 Curlew landed in the catching area but did not settle and lifted again. Dean did a great job twinkling birds from nearby brassica crops and moved some back to the catch field. Friskney New Marsh fields – A large flock of 100+ Curlew quickly arrived into the vicinity of the catching area for Richard’s team. Many of these birds were in safety and no catch could be made. The team used the jiggler to displace birds from the net and most lifted and roosted in the adjacent field. Consequently a small safe catch was made following the main flock moving. It was also a good start contributing to a new study at Cambridge University investigating historical habitat availability inferred from population genetics. A total of 25 Curlew across both Lincs catches were swabbed for DNA and were the first in an ongoing sampling programme for the group. Cathy recced Heacham NN again and found the beach to still hold good numbers of Sanderling. The whole team consolidated and moved back to the Norfolk side on Wednesday afternoon with plans to mist net on the evening tide. Terrington – a small team set mist-nets on two pools on Terrington Marsh. While a few individuals stayed to look after the nets until dark, most of the team returned to base for dinner. There was also another cause for celebration this evening as a cake was presented to Ron for his 70th birthday. The team reconvened at the White Barn for 20:00 when sound lures were placed out on the pools. There was only a small window of suitable catching time this evening when it would be sufficiently dark before high tide. A moderately large catch was made in that short window, predominantly of Redshank. 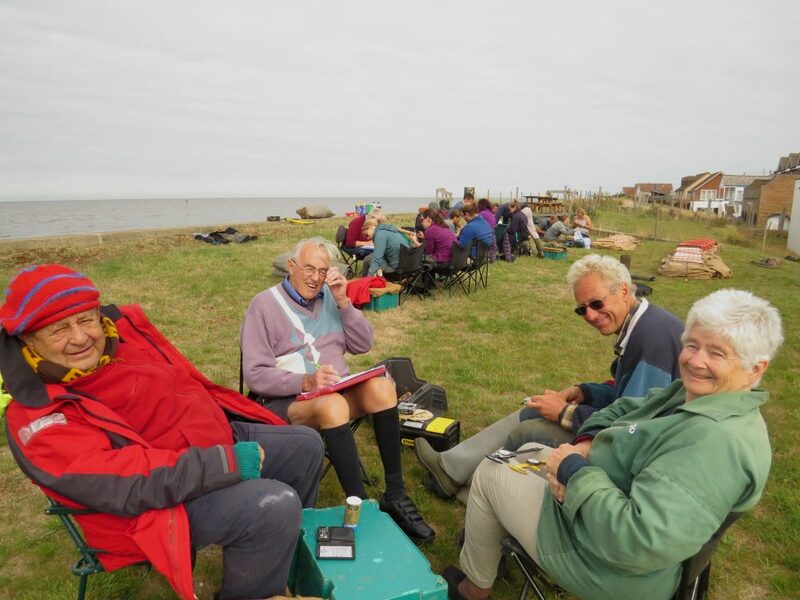 Heacham NN – Two thirds of the team arrived at Heacham for 06:00 to a cold but clear and sunny morning. Three nets were efficiently set along the beach for Sanderling. Before the remainder of the team arrived at base camp, and still a couple of hours before high tide, it looked as if there may have been a catch of c. 40 Turnstone. Unfortunately this didn’t materialise and the teams remained in position. Shortly after the full team had assembled at base camp one net was fired over a small flock of mostly juvenile Sanderling. These birds were very quickly extracted and returned to the base camp and the team awaited a second catch if possible. Only 15 minutes later, and after some active twinkling of birds on the beach, a second net was fired which caught the main flock which consisted mostly of adults. The second catch was notable for a high proportion of recaptures as well as two colour marked birds including one from Iceland. Terrington – Thursday evening saw a return to mist-netting at Terrington. Again there was a nice catch of Redshank as well as higher than expected numbers of Black-tailed Godwit. The team was all back at the base house for 01:30 ready for a relatively late start the following day. The majority of the team woke at 06:45 to head out resighting at Snettisham. It was expected there would be a shorter window to resight than some previous efforts but small groups of Curlew and Bar-tailed Godwit were seen around the sailing club and several flags were read. Good numbers of Black-tailed Godwit were present in the pits and again several more combinations were recorded. The birding was spectacular, as it often is, with large numbers of Knot coming off the Pits low over onto the mud. Bowser’s Farm – an evening mist-net session was carried out by the remaining team travelling to Lincolnshire to maintain effort on other parts of the Wash. Two net sets were put up on two pools. Just around the time of expected peak capture a rain shower passed through and possible deterred birds from moving much. A modest catch was made and all bird were processed and released promptly on the neighbouring fields. 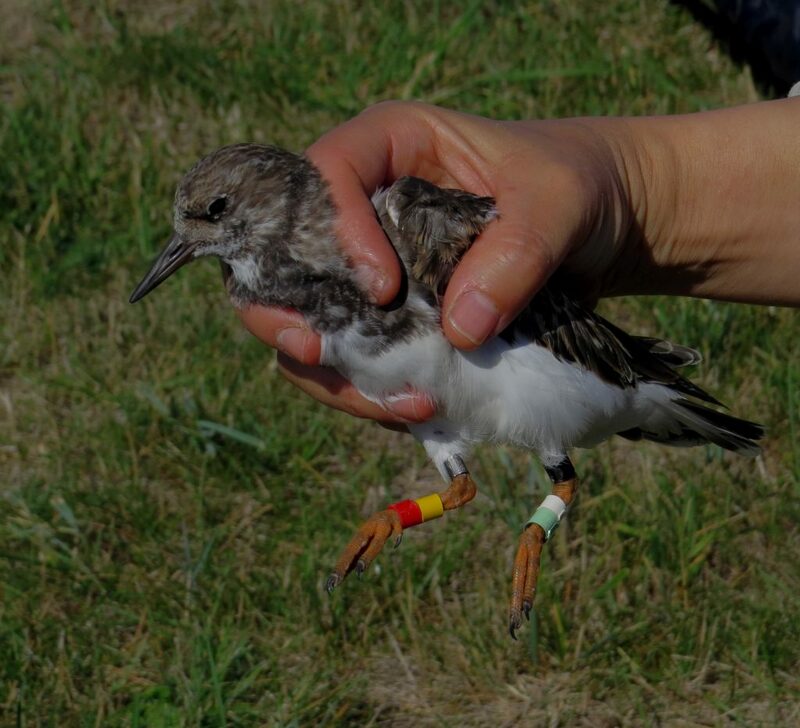 Turnstone are one of the species that WWRG are studying using colour rings. Photo by Cathy Ryden. The remaining team back in Norfolk spent the final morning organising kit, checking data and closing down the house before everyone departed. Once again a huge thanks go to all those involved in supporting WWRG field programme.